The sudden passing of artist Henry “Hank” Kupjack this past February was met with sadness here at CCH. Hank was a friend to CCH staff who had long harbored a dream of staging an ambitious exhibition of his unique miniature rooms, with the proceeds to benefit the Chicago Coalition for the Homeless. The public will get an opportunity to view 21 of these exquisite rooms this upcoming weekend at Navy Pier in the Lakeview Terrace. On Friday, April 19 from 4 p.m. to 9 p.m. there will be a preview party open to the public, with proceeds from this event benefiting CCH. Preview party tickets are $50 each and can be purchased HERE. 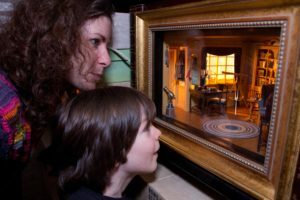 The 21 miniature rooms on display will be a delight for all ages – transporting the viewer into vivid glimpse of history. Many of these rooms have never been exhibited locally. Others have been unavailable for public viewing for several decades. To create these splendid works of art, Hank worked alongside his father, Eugene Kupjack – one of the principal artists behind the famous Thorne Rooms on permanent display at the Art Institute of Chicago. Hank also created rooms working with his brother, Jay Kupjack, and Lee Meisinger. This retrospective exhibit will extend through the weekend, with showings on Saturday, April 20 and Sunday, April 21, from 10 a.m. until 10 p.m. each day. Tickets for Saturday and Sunday are $25 for adults and $15 for students and for seniors age 65 and older. Children ages 6 and under get in free. These GA tickets can be purchased HERE. The exhibit is being held at the Lakeview Terrace, which is at the far east end of Navy Pier, just past the Shakespeare Theatre. For drop-offs and parking, it is best to go to the last turn-in.